This pet is rewarded when your character completes the "Pet Emporium" achievement. To complete this achievement, your character must possess at least 800 unique vanity pets. kind of underwhelming, lookwise, when compared to previous collection achievement reward pets... they should at least increase his size a bit. 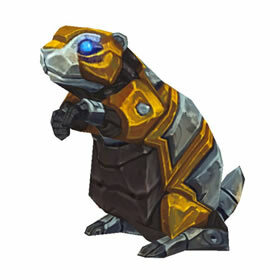 If you have 800+ pets, ROOTER will be added directly into your pet collection. LOL I was checking my pet logs for new PVP pet I had in my bags when I first logged in today and found Rooter....didn't even know about this pet coming to us. I haven't received it, any idea why? His moveset and breed don't match unfortunately :( You would want him to be more speedy. Built to dig holes by a gnomish farmer, Rooter quickly and predictably went haywire, with disastrous results.